DENVER, Colorado (CNN) -- A new national poll suggests that there's a reason why Wednesday evening's theme of the Democratic convention is "Securing America's Future." A new poll finds that Sen. Barack Obama trails Sen. John McCain on the issues of terrorism and Iraq. Without better marks on foreign policy and national security issues, presumed Democratic presidential nominee Barack Obama may have a tough time securing his future in the White House. A CNN/Opinion Research Corporation poll out Wednesday indicates that the American public considers presumed Republican presidential nominee John McCain better than Obama on terrorism and Iraq, and voters consider McCain a stronger leader who would have better judgment in an international crisis. By a 51 percent to 41 percent margin, voters regard the senator from Arizona as the stronger leader, and they think he would have better judgment than Obama in an international crisis by a 52 percent to 43 percent spread. The two candidates recently differed on how best to deal with Russia over its invasion of Georgia. Both criticized Russia, but McCain has talked of creating a new G-8 -- the group of the richest countries in the world -- that would expel Russia. Obama called McCain's position a mistake. On the issue of the Iraq war, McCain supported the U.S.-led invasion and has consistently called for seeing the conflict to a successful conclusion, without so-called timetables. The senator from Illinois opposed the invasion. 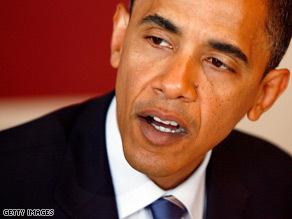 Foreign policy aside, could Obama win the election on domestic issues? The Forum: What's your view on national security? "Yes, but he may need to work on energy and taxes, two economic issues that have been the target of several recent McCain ads. Obama has a comfortable 8-point edge on economic issues overall, 51 to 43 percent," CNN Polling Director Keating Holland said. On gas prices, Obama had an 11-point advantage in July, which has narrowed a bit to 6 points now. And on taxes, a slim 51 percent to 45 percent edge for Obama in July is now a virtual tie: 48 percent for Obama, 47 percent for McCain. "But the McCain ads may have come with a cost: Half the public thinks McCain has attacked his opponent unfairly, while only a third feel that way about Obama," Holland said. Obama maintains a large lead on health care and also has an advantage on personal qualities that deal less with foreign policy: caring about people, bringing change and uniting the country. But what could really help Obama -- or McCain -- close the deal is convincing the public that he has a clear plan for solving the country's problems. "Neither candidate scores well on that measure, and the conventions are the first and best chance to present clear solutions to current problems," Holland said. The CNN/Opinion Research Corp. poll questioned 1,023 adult Americans by telephone Saturday and Sunday, after Obama's naming of Sen. Joe Biden of Delaware as his running mate. The survey's margin of error is plus or minus 3.5 percentage points.